A Meal in Winter is a slim novella, yet it punches well above its weight. The setting is the heart of the Polish countryside at the time of the Second World War. The novella opens in a military camp as three German soldiers — Bauer, Emmerich and the unnamed narrator of the narrative — appeal to their camp commander by volunteering to look for any Jews who might be hiding in the surrounding area. By so doing, the soldiers hope to avoid the more harrowing task of executing captives, as they would ‘rather do the huntings than the shootings’. The commander grants the soldiers’ request and they leave at the crack of dawn the following morning before the first shootings begin. This means missing breakfast, too, but it’s a price they’re willing to pay to avoid their immediate supervisor, the heartless Lieutenant Graaf. They find a young Jewish boy cleverly concealed in a hole in the forest, only given away by the heat and snow-melt surrounding the ground-level chimney of his dug-out. Relieved at having captured a prisoner, the soldiers head back to camp. Chilled to the bone, tired and ravenous, they chance upon a deserted hovel and decide to shelter awhile. In desperate need of warmth, the soldiers build a fire and begin to prepare a simple soup from a few meagre ingredients; meanwhile their captive sits quietly in the storeroom. A Polish man arrives at the hovel; at first his intentions are unclear but his actions soon show his vehemently anti-Semitic nature. As preparations for the meal unfold, questions arise: should the soldiers share their meal with the Pole in return for a slug of his potato alcohol? Can he be trusted? Will tensions flare and erupt? The mood oscillates and small shifts in the dynamics unfold across the group as each soldier starts to question his choices and the moral implications of his mission…and shadows cast by earlier events are ever-present. This is a stealthily gripping novella with a real sense of foreboding. The small cast of five key characters coupled with the confined setting of the hovel give the drama a theatrical feel and I could almost see it working as a play. I love the way it quickly whips up an atmosphere and tangible sense of place from the first page. The prose style is fairly spare and to the point (and hats off to Sam Taylor for some sterling work on the translation). There’s not a spare word on the page, and yet it manages to pack a great deal into 135 pages. The soup looked good and smelled good. The slices of salami floated on the surface, carried there by the cornmeal, now cooked. The melted lard was still boiling. Dare I say this is another book I’d love to see on the Independent Foreign Fiction Prize (IFFP) shortlist? While Mingarelli has written many novels and short stories, this is his first to appear in English; I sincerely hope we’ll be able to read more of his novels and short stories in years to come. I read this book as part of an IFFP-shadowing project led by Stu. Other members of the IFFP shadow group have also reviewed A Meal in Winter: Stu, Tony Messenger and David Hebblethwaite – just click on the links to read their thoughts. This review was originally published as a guest post on Tony Malone’s blog (25th March 2014) and Tony has kindly granted his permission for me to republish it here. 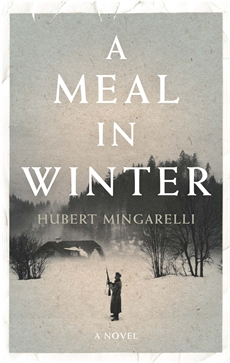 A Meal in Winter is published in the UK by Portobello Books. This entry was posted in Book Reviews, Mingarelli Hubert and tagged #TranslationThurs, Book Review, Fiction, France, Hubert Mingarelli, IFFP, Literature in Translation, Portobello Books, Sam Taylor on May 1, 2014 by JacquiWine.